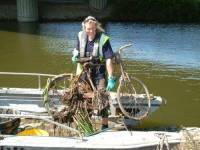 Below is a sample of the Services offered by Harbour Clean. 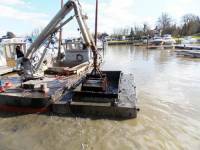 All enquiries welcome for any work in the harbour, marina, inshore or waterway sectors. 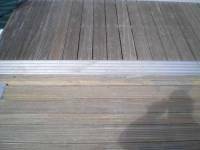 Small jobs at competitive prices a speciality. Specialist in shallow water (<3m) dredging of inland marinas, waterways, rivers, lakes, ponds and canals utilising backhoe, grab and pumping technologies. 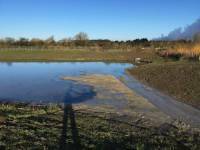 Broad expertise in the beneficial use of dredged material and in bank stabilisation using geotextile bags. Own fleet includes Nviro Hercules, an ex-BW spud leg narrow beam dredger (backhoe, grab and suction), Nviro Njord amphibious tool carrier (Truxor-type, backhoe) Nviro 6, a self-contained pump barge, and an 8T excavator mounted on a modular barge. 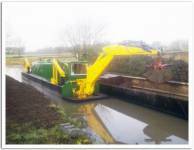 Additional capabilities from long-reach excavators, jack-up barges c/w mini digger, skip barges and a waterjet-powered tug/workboat. Sustainable Urban Drainage System maintenance specialists with experience of working in simple to complex attenuation systems from large lakes to small wet ponds. Engaged by large national house builder under a 3-year framework agreement for construction sites of up to 3500 units in central England. Remediation of lakes, watercourses, surface drains and swales using amphibious tool carrier, long reach excavator and specialist shallow water tools. 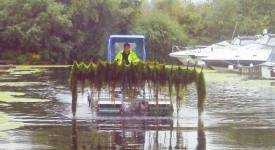 Using the innovative "Njord" class of amphibious boats Harbour Clean is able to offer a wide range of weed and reed cutting services, waterway maintenance and marina clearance operations, anywhere in the UK. 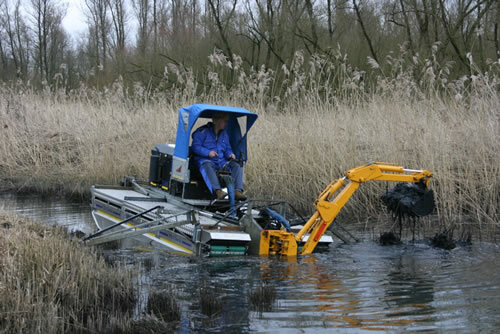 The Njord is an amphibious machine based on the innovative range of Truxor tool carriers (4600, 5000 and TR Classic), ideally suited to the maintenance and restoration of harbours, marinas, canals, waterways, marshes, ponds, embankments, flooded land, etc. 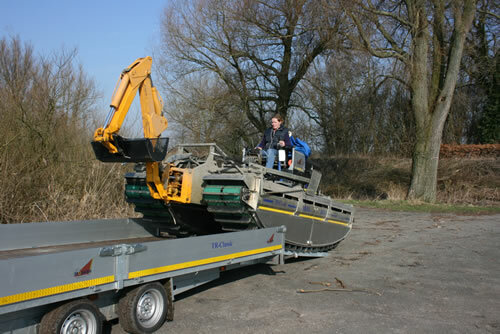 Easy-to-connect equipment facilitates a rapid installation of the appropriate tool kit, turning the machine into a dredger, mower, harvester or excavator in minutes. The Njord is fully multi-functional allowing Harbour Clean to exploit the machine’s potential to the full. The Njord can be operated both on land as in water. The machine is very manoeuvrable and is capable of rotating on its axis in the water. It is therefore ideal for use in inaccessible marsh areas and shallow water. 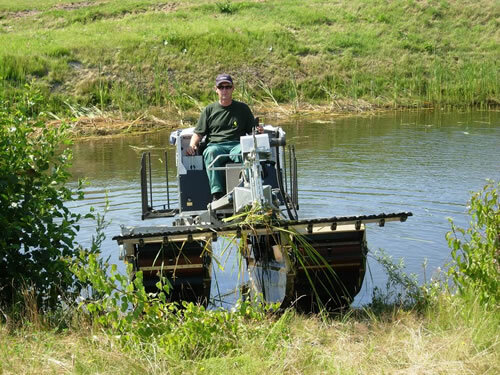 Due to its light weight (1.2 tonnes) distributed over two broad tracks, it is suitable for sensitive areas such as parks, cultivated gardens and golf courses. The minimal ground pressure of the amphibious machine directs virtually no damage to the substrate during operation. 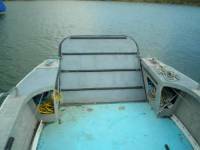 Depending on the type of work, the relevant tools are attached to the lift arm or, if appropriate, directly coupled to the vessel’s hydraulics. 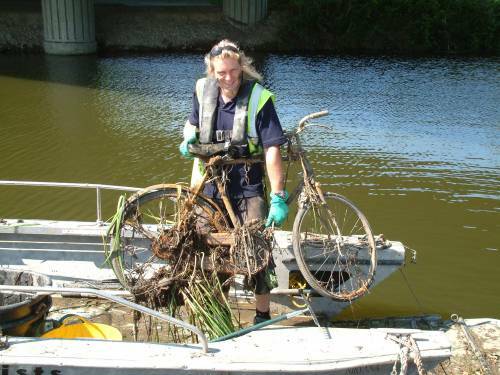 Floating debris and weed is an increasing problem in all marine environments. - Dyeing: in which special light inhibiting dyes are sprayed on the water that inhibit growth of the weed and/or kill the weed in situ. 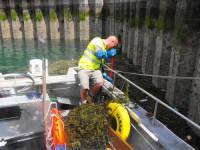 Harbour Clean can advise and recommend specific weed control techniques on request. Utilising the ever-popular Jeanneau Merry Fisher 635 workboat, Harbour Clean is able to offer a range of shallow water, river and tidal harbour hydrographic surveying and launch services. 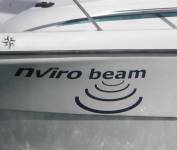 Powered by an inboard Nanni diesel "Nviro Beam" can troll all day at slow speed or cruise at up to 14 knots, depending on sea state. 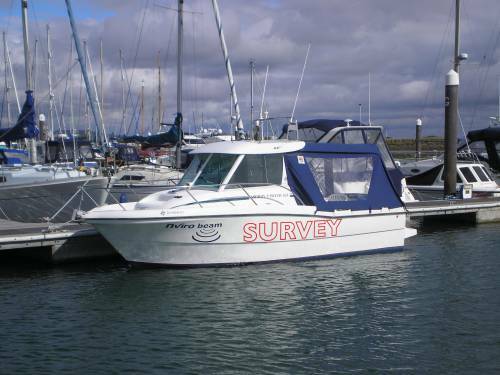 The ample deck area can provide comfortable accommodation for a full hydrographic survey suite and/or up to four persons up to a 990kg payload. Available with skipper and crew, the vessel is road transportable on its own twin-axle trailer and is self-launching on even the most basic of slipways. 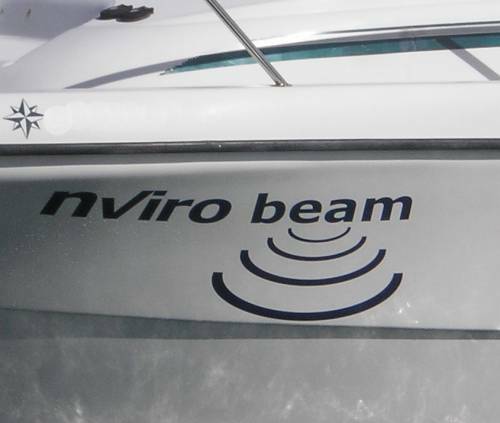 Standard equipment on the vessel includes single bean echo sounder, 2 x GPS, electronic chart display, and VHF with DSC. 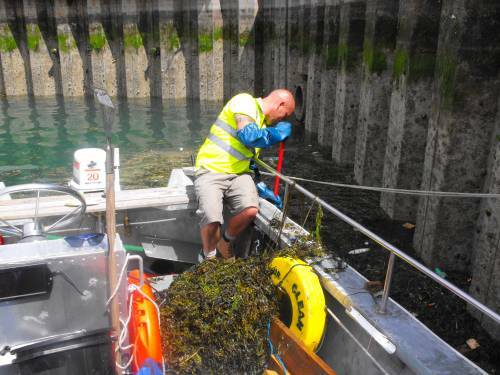 Cleaning of pontoons and slipways can be very time-consuming for busy harbour and marina staff - yet allowing a build-up of weed and algae can be both a health and safety issue and a poor reflection on the level of upkeep of a marine facility. 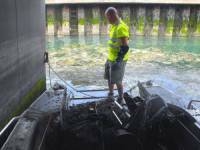 Harbour Clean offer a one-stop-shop solution of both deep-clean and regular maintenance services. 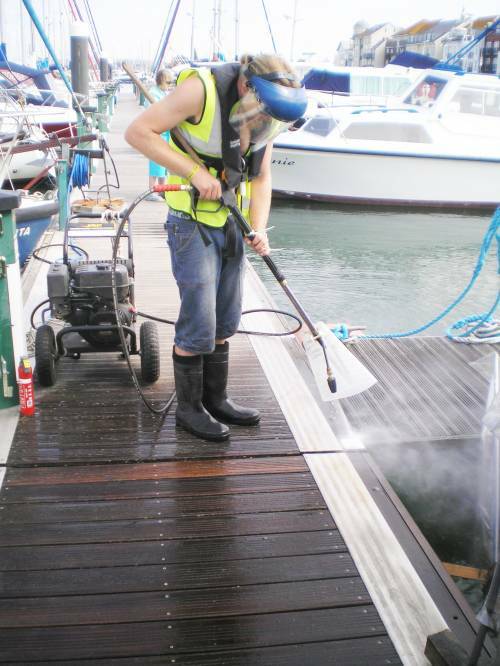 Utilising a combination of mechanical scrubbers, pressure washers and rotary cleaners, combined as appropriate with environmentally-sensitive (chlorite-free) solutions, Harbour Clean are able to provide the ideal solution to pontoon and slipway cleaning problems. Designed to be unobtrusive to day-to-day operations, the Harbour Clean service may be tailored to budget and operational criteria to suit the customers specific requirements. Call now for a free survey and estimate. 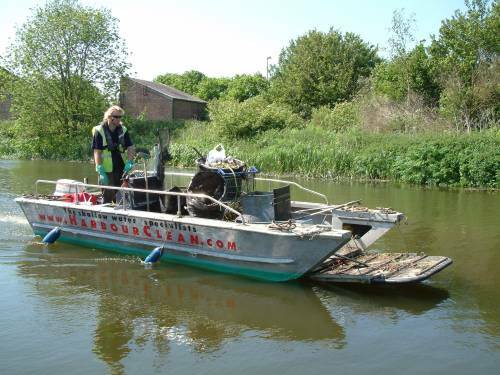 Harbour Clean offers a range of innovative solutions to the collection, management and control of marine debris and other pollutants in a range of marine environments, from large ports and harbours, to inter-tidal foreshores, rivers, lakes, waterways and even flooded land. 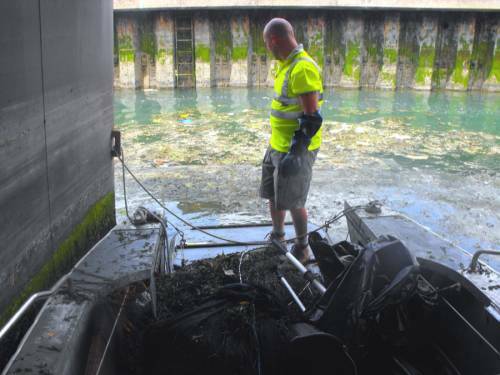 Utilising exceptionally shallow draft vessels and unique shore recovery techniques, Harbour Clean ensures total environmental management in areas normally considered to be inaccessible by conventional craft and traditional debris collection practices. 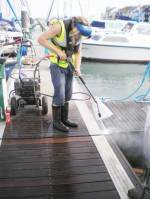 Harbour Clean offers a range of innovative solutions to the upkeep and maintenance of a clean environment in marinas and docks. 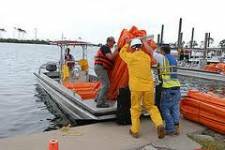 Services include the collection, management and control of marine debris and other pollutants in the close confines of marinas, boat berths and enclosed docks. 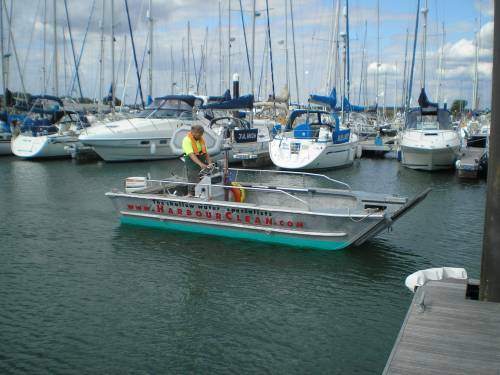 The Nirvana class workboat is ideally suited for deployment of oil spill control and clean-up equipment, especially in shallow water areas such as inter-tidal, river, lakes, ponds and waterways. 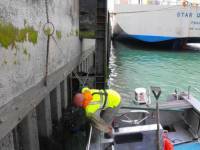 Utilising access via the wide and strong bow door, Harbour Clean are able to launch and recover floating booms, skimmers, barriers and buoys with minimal delay and manpower. The main deck may be drained into a dedicated oily water holding tank for discharge later into separators or recovery tanks ashore. Spraying equipment and dispersants may be carried conveniently on the main deck up to a total weight of 1000kg (subject to weight:height restrictions). As an alternative option, the charter Buddy class catamaran offers direct and automatic collection of floating oil spills with recovered residues stored directly onboard. 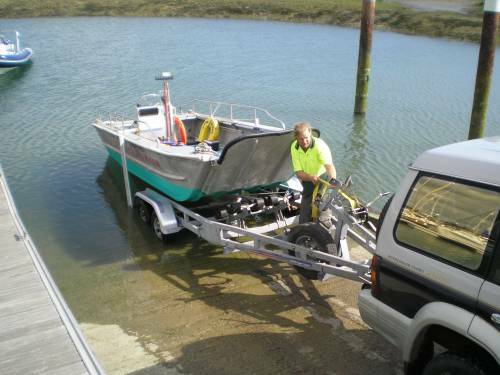 Utilising their fleet of highly manoeuvrable and multi-purpose workboats, Harbour Clean are able to offer stable, adaptable and spacious work platforms for a multitude of support functions to the marine civil engineering sector. Shallow draft (<6”; <150mm) operation ensures that close inshore and inter-tidal areas may be worked for extended periods of the tidal window. Due to their strengthened flat-bottom design, the vessels are also able to dry out over low water, even when loaded. Low air-draft (approx 750mm) means that inshore spans of bridges and the undersides of low structures (such as linkspans) may be accessed afloat for extended periods. The ‘Nirvana’ class is able to load contractor’s plant (compressors, generators, power tools, etc) up to a maximum of 1000kg on a clear deck, accessible direct from the shore via a strengthened bow ramp (capable of lowering to -20° below horizontal). Waste material may be easily removed from site via wheelbarrow loads over the bow door or via specially adapted heavy-duty collapsible bins that are suitable for pallet-truck or forklift transport. 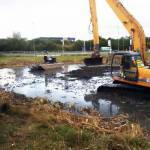 SITE CLEARANCE AND RE-ESTABLISHMENT AT THE END OF PROJECTS AT EXTREMELY COMPETITIVE RATES. 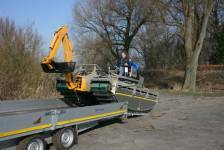 The Nirvana class workboat is capable of loading and unloading a range of wheeled plant and equipment via a strengthened bow door. Equipment, personnel, tools or cargo up to 1000kg (gross) may be carried (subject to weight/height distribution restrictions). Specially adapted heavy-duty collapsible bins may carry loose cargo and be loaded by pallet truck or light forklift. 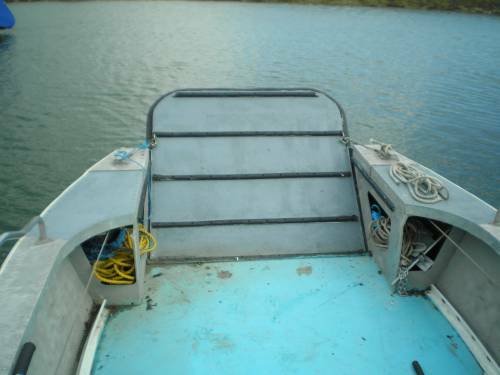 Personnel (up to 5 persons in total) may also board dry via the bow door direct from the shore (bow door lowers to -20° below horizontal and is ribbed for non-slip access). Persons in the water, or on other boats, may board conveniently with the bow door lowered to water level. 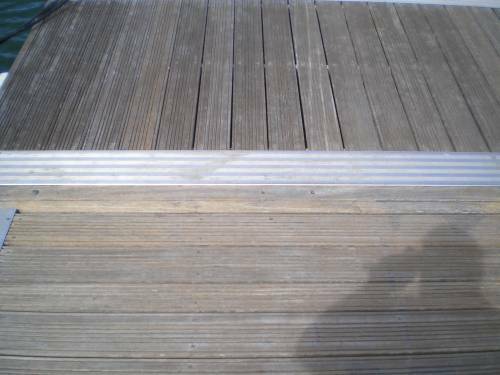 The main deck is self-draining and the double-bottom tanks ensure excellent stability even with the main deck flooded. 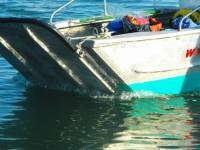 Vessel is certificated as a Passenger Vessel by Portsmouth City Council. 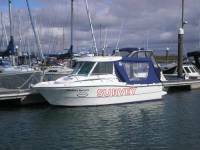 Additionaaly, the vessel is manned and equipped in accordance with the requirements of the Small Commercial Vessel Code and as set down by the Solent and Southern Harbour Masters Association (SASHMA) and the Maritime & Coastguard Agency. 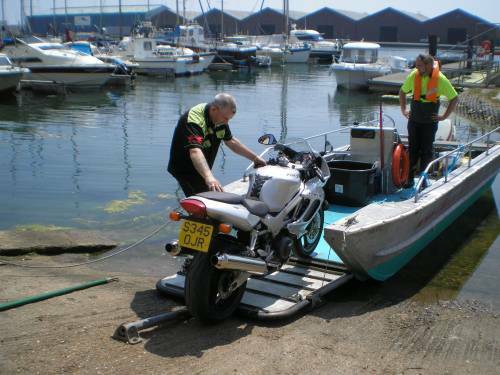 All Harbour Clean craft are transportable by road trailer at low mobilisation cost. 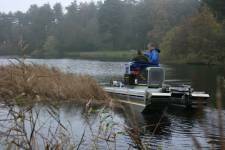 Capable of being launched from shallow slipway, river bank or canal-side, the craft are quickly deployed using minimal personnel resources. Recovery is equally straightforward and allows for a full work window to be utilised to best productivity.